The shape makes all the difference! The Ogilvy Dressage Profile Pad is a great everyday saddle pad that's uniquely designed to keep your horse comfortable. Spine Measurement: 25" or 26"
Drop Measurement: 20" or 22.5"
Spine Measurement 25" or 26"
Drop Measurement 20" or 22.5"
Give your cold-backed horse (or any horse, for that matter) the edge with Back on Track's western pad. Top riders worldwide have found that using this thin pad under their regular pad greatly improves their horse's performance. 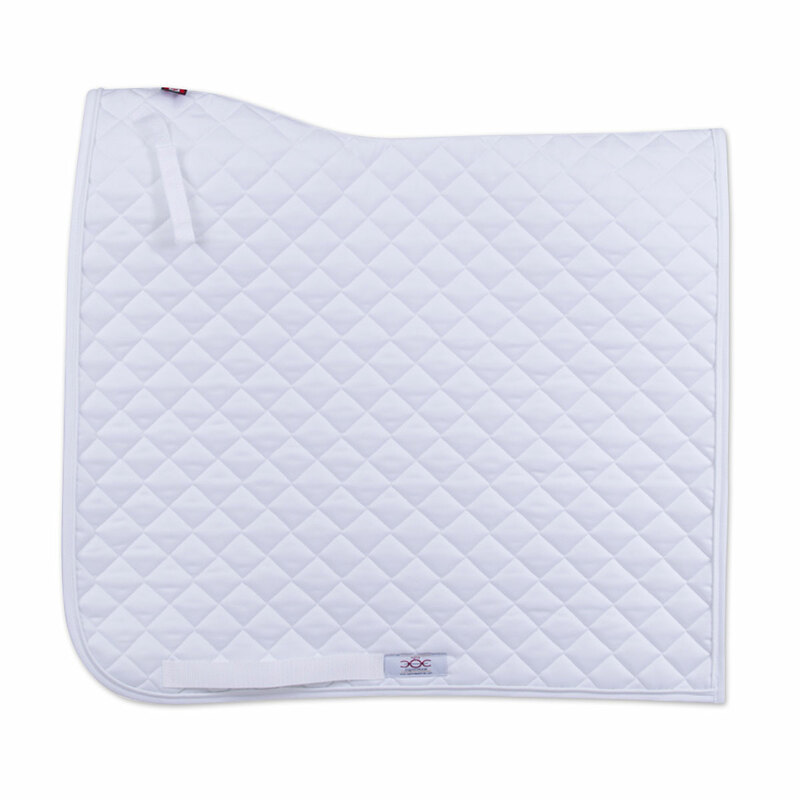 Ogilvy Dressage Profile Pad is rated 4.1 out of 5 by 9. Rated 2 out of 5 by WhyMe from Beware you do not get the pad pictured I love Ogilvy pads. The problem here is the pad pictured has a square back but what you received is a rounded back. Rated 4 out of 5 by Emi L from Love this pad! I bought this pad about a month ago to use as a schooling pad and got an extra to show with and I love them so much! I have a mono flap saddle so the d-ring strap is very useful and I love how thin the pad is too and how easily it stays clean. My saddle pads have a habit of slipping back under my saddle but these have stayed in place. I have had to wash it more frequently than some other pads because it is thinner so it turns yellowish from the sweat soaking through which hasn't happened with any other pads I've owned, but thats a small price to pay considering all the good stuff about it. Rated 5 out of 5 by ShannonH from Great dressage pad! Purchased for shows. I have 4 of these pads and love the fit and weight for the south. Rated 5 out of 5 by Morganlover from A very nice pad This pad fits well, has good wither relief, and is nicely made. It has a soft lining, useful billet guides, and a nice amount of padding (not too much). The only thing I don't like is the little metal button with the brand label. Rated 2 out of 5 by Linda from Beautiful saddle pad! This very generous saddle pad is a great "fit" for my horse. Rated 4 out of 5 by Jude from great size and cut I have been using the friction free pads from Ogilvy for several years. I have previously purchased from Ogilvy (from Canada) and Schlese as their pads are made by Ogilvy. Was happy to see Smart Pak carried. I tried this pad for the first time as an alternative to the friction free pad. The pad is cut the same which I like, and is the excellent quality I have come to expect. What I did not like about THIS pad was the stitching on the girth strap holder - the kind where there are little sections to put the strap through. Actually I was quite dismayed when I saw this. However, it was not too difficult to pull that stitching out and having done that without consequence, I am very happy. Rated 5 out of 5 by razz from Great Size I bought this because I was having trouble finding a pad that was long enough to not get in the way of my billets. This has done a great job. Rated 5 out of 5 by mpwilliams from Super-giant pad! This is the only pad big enough for my horse. It is great quality and cleans easily. The slightly fuzzy lining feels great and doesn't hold dirt like you'd think. It's a great pad. Rated 5 out of 5 by pollyp from Great pad that comes in a larger size!! Dressage pads use to be the bane of my existence. With a gelding that is not only wide but long backed, finding a dressage pad that looked good under his saddle was quite frustrating! Three years ago I found Ogilvy saddle pads and I have not looked back! All of my dressage pads are by Ogilvy now. Great quality and craftsmanship and they last forever! I always recommend to people to pick up an Ogilvy pad - if you can't afford the half pad then get a profile pad - try something. These are my go to pads - I have at least one in every cut/style.